A most thrilling hat and feathers. A korero among the Maori is held on the beach at Shortland in regard to a dispute amongst themselves about the land on the other side of the Kauaeranga Creek.The NZ Herald correspondent watches with bemusement and takes more notice of the fashions worn than what actually happens. Chief Taipari is there in great force with Mrs Taipari, who is dressed in a most thrilling hat and feathers, and an extremely long patterned dress, the beauty of which is unfortunately marred by a shabby shawl. The opposing factions are seated opposite one another and the orators on each side declaim, question, abuse, snub and sneer at each other. Taipari speaks a few words of dignified disapproval, although they do not appear to have any calming effect. He is answered by a belligerent Maori dressed in a purple shirt, black waistcoat, Albert chain - and possibly a watch - who works himself up into a very moral state of mind. 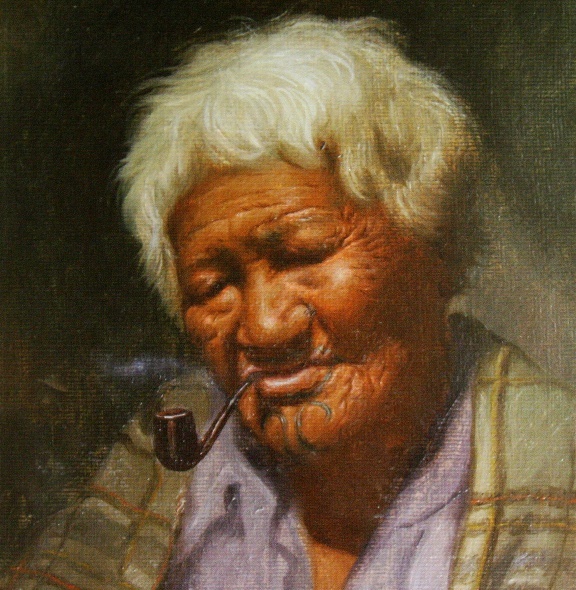 A Maori lady in blue print, and white sunbonnet trimmed in black, a real Cleopatra in appearance, paces up and down waving a white handkerchief, laughing scornfully, and after crossing “the floor of the house” and aggravating the other side for a long time, lights her pipe and sits down with the other ladies, who treat her with great distinction. The European's drive a good trade during this korero by selling bread and buns. At the Auckland Queen Street studio of Mr R H Bartlett, there are on view some highly finished sketches of landscape scenery – some of the Thames - demonstrating the wondrous development which the photographic art has undergone during the past few years. At the Thames a new reef, exceedingly rich, is discovered today and is named the Mosquito. It is about one mile to the north of the Portuguese claim and nearly three miles from the township. The Horseshoe claim is doing remarkably well – three new leaders all thickly impregnated with gold have been struck. A petition to declare Shortland a port of entry is signed by many influential inhabitants and traders of the Thames. The petition details that the township has some 200 places of business and dwelling houses and an estimated population of about 8,000, almost all adult. The Thames is distant fifty-five miles from the port of Auckland and is without any means of bonding dutiable goods; duty has to be paid three months in advance. This needlessly adds to the cost and causes great disadvantage to the merchant and trader. The Thames needs to be proclaimed a port of entry and warehousing port within the Colony of New Zealand. Yankee Irish and Jemy the Greek are among the Thames residents who sign the petition for a port of entry. Avon for the Thames with 25hhds ale, six casks ale, 2,000 ft timber, one ton flour, one ton potatoes, 1,900 palings, one retort, one bottle quicksilver, three horses, two drays, passengers. Rangatira for the Thames with one parcel, one case kerosene, eight hhds, one case, eight bags potatoes, two cwt flour, three boxes, three cases spirits, 2 ½ tea chests tea, five kegs stout, one keg butter, two bags oatmeal. Tartar for the Thames with 11,181 ft timber. Forth for the Thames with 10,000 ft timber, 1 case spirits. Severn, Diamond, Alacrity and Catherine all leave this evening for the Thames with full cargoes of timber and merchandise. The machinery erected on the Shotover claim is busy being used by other claimholders, who have been waiting for an opportunity to crush their quartz. John Willis, lately a settler at Mt Albert, is coming across the Karaka flat, in the line of Mackay Street, in the company of three other men as dusk falls. They hear the noise of horses behind them. John Willis remarks it must be some horse race, and on turning they are faced with a mob of horses coming towards them at full gallop. Before the men have time to get out of the way, one of the horses, a mare, strikes Willis with its two forefeet, sending him flying for several yards. He is severely injured with a broken collarbone, broken ribs and his face and left leg are badly damaged. William Gibbons is also knocked down, but uninjured. John Willis is taken to the Northumberland Hotel on Mackay Street where he lies in a very precarious state, attended by Dr Clarence Hooper, who is assisted by Dr Lethbridge. John is conscious but has no recollection of the accident. The deplorable accident has been caused by allowing breeding stock to run at large at the Thames. The wife of a mill owner, while riding towards Point Tararu, is also attacked by the same animal and several others report being charged. There is an alarming cry of fire but it is merely a lot of ti-tree scrub burning. A block of land to the south of the Thames is thrown open for gold mining. Mr Mackay placards the Court House whare with the long awaited information that Europeans are at liberty to prospect for gold towards the south as far as the Hikutaia River. The Hikutaia and other streams between Kirikiri and the boundary now open are known to contain gold. Allan McIssacs comes into Shortland from Tapu Creek to secure a prospecting claim for a reef discovered on one of the spurs rising from the main stream. It dips on each side into two small gullies where gold has been found by sluicing. McIssacs came through from Coromandel and decided to try his luck at the practically unknown Tapu field. Now a rush starts for Tapu and claims are marked out on the ranges and in the gullies. The prospectors strike a loose rubbly reef three feet through in which gold is plainly discernible. This creek may give profitable employment to many of the surplus population of Shortland; there are presently about 300 men at Tapu. The ss Midge, which has been laid up for a thorough overhaul, begins daily trips to the Thames today. She presents quite a new appearance. A crowd of some five or six hundred men are milling around the landing place at Shortland as the steamer comes in tonight – perhaps because of the throwing open of more land or because of the extreme beauty of the evening. A little schooner, Gleaner, which has been feared missing, is discovered safely anchored at the Thames. She was thought lost with all hands on board while on her passage from Whananaki, near the Bay of Islands, to the port of Auckland, during one of the recent heavy gales. She left Whananaki in October with a cargo of pigs but up till now she had not reported herself in port, nor had she been seen or heard of anywhere on the coast. She had on board the owner, Mr Spithill, and his son, a lad of 15 years. The wife of Mr Spithill and his large family of young children at Whananaki were facing destitution. Mr Spithill however has been working in a claim at the Thames diggings leaving his son in charge of the vessel, which was lying about a fortnight since in the creek near the Maori pa, at the Thames. Many inquiries have lately been made at the custom house - the vessel is safe and her owner is doing well at the diggings. The Enterprise is still laid up for cleaning and painting and after inspection by the Government Inspector of Steamboats will resume her trips to the Thames. The township of Shortland is assuming large proportions. Building is going on in every direction. The whole flat, extending from the limit of the town to Kuranui Creek has been leased by the Maoris at prices varying from £25 to £30. There are numerous newly discovered reefs and in some instances they extend to three and four miles beyond the township. Several of them are said to contain auriferous stone in large quantities. Practically speaking there is no machinery on the ground. Mr Goodall has six stamps going. The power is, however, too limited and the machinery is generally not of the character to fairly test the stone. Mr Fraser has only one stamp head in working order. Mr Graham’s machine of 12 head of stamps, which will be worked by a 14 hp engine, is in the course of erection. There is room for much more powerful machinery at Shortland. Trade at Shortland is dull, chiefly owing to the delay in erecting machinery, with the exception of the publicans, who have more faith in the prosperity of the place than others, and there is not much business done. At Manaia there are prospecting parties out, two of which have been there for some days. One thousand Pakeha's will come. There is unrest in the Upper Thames as European diggers quietly try out the ground. A party of five diggers prospect at Mr Thorpe’s Ohinemuri property with his permission. They only sink a few feet but do not like the look of the ground. They are watched with suspicion by Maori, and the young Maori men who had brought the diggers up in their boat from Shortland are ordered to leave and go down the coast and stay there for daring to bring the diggers to the Upper Thames. As the party start back overland for Shortland Captain William’s party of five arrive at Mr Thorpe’s farm and also obtain permission to prospect. The same Maori tell Mr Thorpe to send them back to Shortland, but Mr Thorpe refuses. They sink a shaft some 18ft, through mostly solid blue clay and finding no bottom they also give up. One of the Maoris tells Mr Thorpe "If you allow these pakehas to dig on your land and they find gold, then 1,000 pakehas will come into your land, and from there go on to our land, besides which we shall be afraid of so many pakehas." More alarmingly, a European on his way from Tauranga to Shortland, is travelling quietly along the road when he meets some Maori who catch hold of him and strip him of everything but his drawers. They throw him to the ground and one is in the act of raising his gun to shoot him when he is stopped by other Maori who arrive on the scene. They catch his arm and tell him to stop that bad work, and that at Hauraki no Europeans have been killed, nor are they to commence that murderous law. Around 800 men attend a meeting called by Mr Mackay to appoint a committee of 24 persons to revise the existing goldfields rules and regulations. Allan Baillie, Warden, is called to the chair and states Mr Mackay, although having convened the meeting, is absent through illness. Twenty four men are duly elected, including Major Von Tempsky. After the meeting another great gathering takes place where several Maori amuse the crowd by discussing which is the best field for a new rush. One energetically declares that the new ground to the south is the best, while another, mounted up behind him, continuously shouts 'No fear! no fear!' at the end of every sentence. The meeting suddenly ends when the Maoris are unceremoniously pushed over the stack of timber on which they are standing. Whau for the Thames with 6,000 bricks. Harriet for the Thames 4,000 ft timber, 15 cases fruit, 13 cases groceries, ten kegs lead, five drums oil, ten tons stores. Rob Roy for the Thames with 2,000 ft timber, one ton flour, ½ ton coals, one case brandy, six casks beer, 1 ¼ cask whiskey, 10 gallons oil, 3,000 shingles, six bags potatoes, 40 cases beer, one cask picks. Services are held as usual at the court house, morning and evening. Summer weather at last sets in punctuated by fine, warm showers. 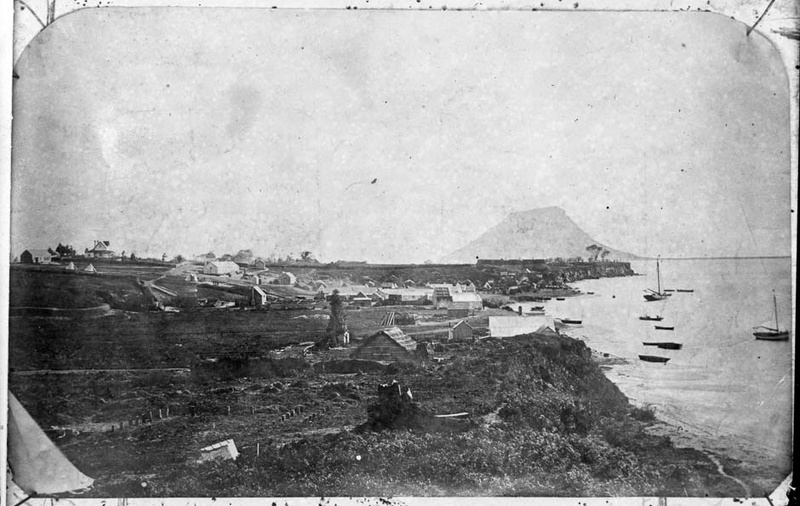 About seven miles of land to the south of Shortland Town is opened this morning and large numbers of prospectors leave the Karaka for the new ground. Mr MacKay issues a notice to the effect saying that the Otunui block is opened for prospecting. This completes the block between Manaia to the north and Kirikiri to the south. There is no land open south of the Kirikiri River. The land as far as Hikutaia has all been negotiated for but the numerous questions about reserves and inter-tribal boundaries are not yet completed – they would have been, but for the continued and severe illness of Mr Mackay. Gold is reportedly struck on a new claim situated about 2 ½ miles from Tookey’s and on the main range behind the Shotover and Barry’s claims, 1,000ft above sea level. The NZ Herald crows "At Auckland scarcely a steamer has come up during the last week without bringing a parcel of gold In spite of croakers who prophesised that the goldfield would not last a month, it has lasted nearly six months and has continued to increase in extent in population and in yield while it promises to exceed any other quartz reefing goldfield in the colony in richness." The Enterprise, in consequence of repairs not having been completed, is detained from sailing unit 3.30 this afternoon. Avon for the Thames with 9 hhds beer, four casks beer, 10 bags sugar, 10 cases biscuits, one cow, one horse, two casks lemonade, three cases ginger beer, one ton flour, five cheeses, four bags potatoes, two cases, four kegs, 9,500 singles, seven passengers. The fine hot weather sees the formation of roads at Shortland Town proceed rapidly. A number of men are actively engaged in laying down fascines and others are putting the thoroughfares into something like civilised and decent order. Diggers are busy on their claims or have joined the new rush to the newly opened ground, where gold had been found in at least one case. Willie Winkie for the Thames with one box merchandise, one cask sugar, one sack potatoes, one bar iron, one horse, eight sheep, other stores. Rangatira for the Thames with 7 hhds beer, 1 box. John Willis, who was run down by a rogue horse on the Karaka Flat, dies this evening, leaving a widow and seven children, the youngest of which is only a few months old, destitute. Allan McIssacs is also referred to as an old Californian digger, suggesting he joined the rush there in 1848. Dr Charles Frederick Lethbridge arrived at Coromandel in early 1867. He had come from London on the ship Maori , as ship's doctor, on her eleventh voyage out, a pleasant but somewhat protracted journey of 117 days. She brought a full cargo and 77 passengers and reported no sickness during the passage. One male baby was born during the voyage. In April 1867 Coromandel’s Dr Wilson announced he was leaving to practice in Auckland. Dr Lethbridge is reported as having brought this practice but he will frequently appear at the Thames.